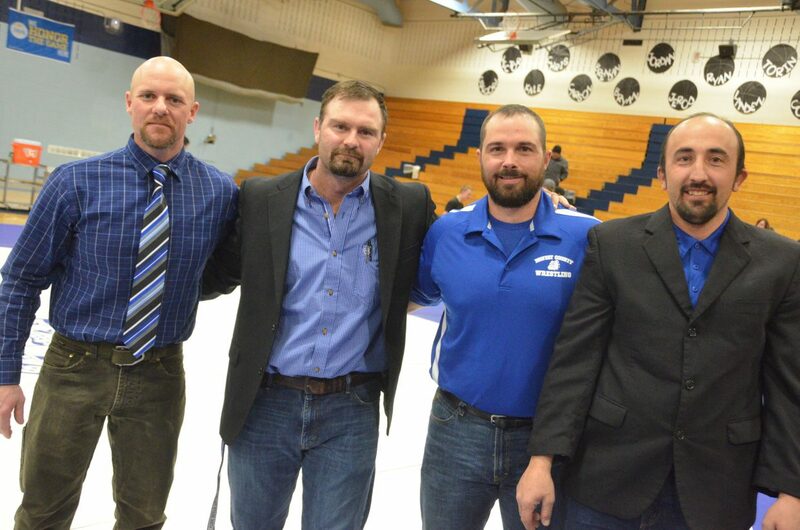 Moffat County High School's Derek Powers, left, joins cousin Greg Hixson on the mat for Senior Night MCHS wrestling. 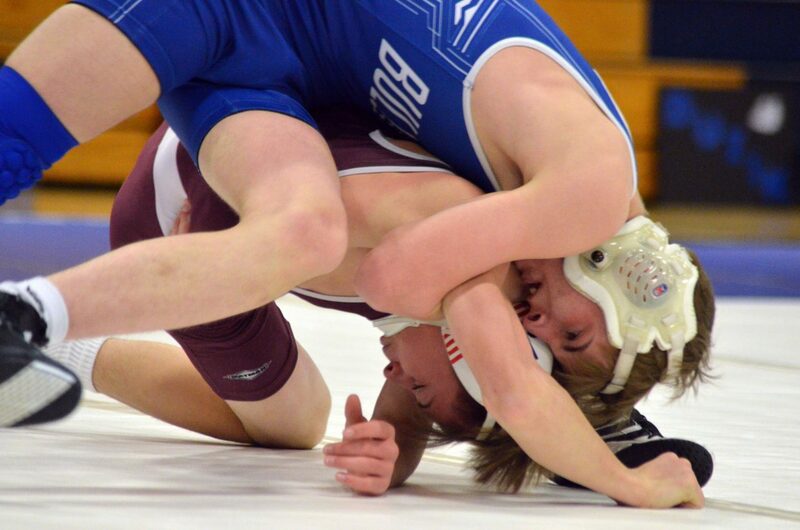 Moffat County High School's Caden Call turns the tables against Palisade's Jacob Lee Friday night. From left, Moffat County High School coaches Jarrett Caddy, Dusty Vaughn, Kurt Kostur and Anton Fredrickson celebrate a good win Friday night. 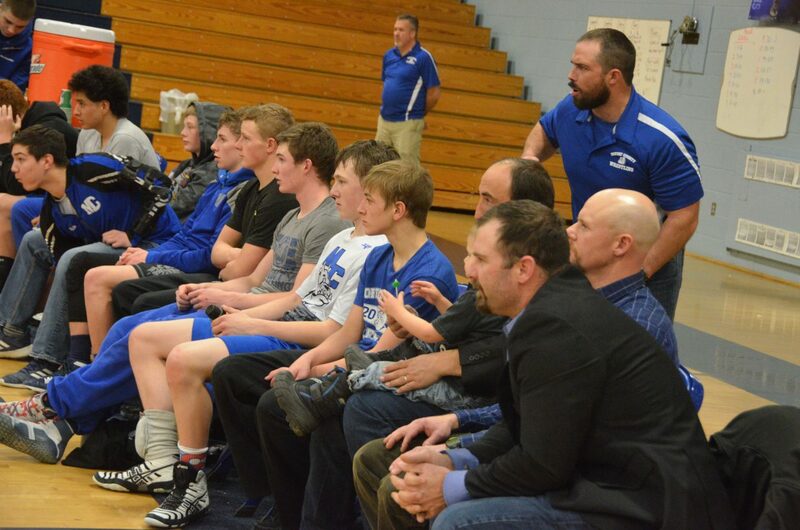 Moffat County High School wrestlers and coaches cheer from the bench Friday night. Moffat County High School's Isiaih Herod stays atop Palisade's Cobe Clark Friday night. Moffat County High School's Daniel Caddy provides tough competition for Palisade's Nathan Bollinger Friday night. 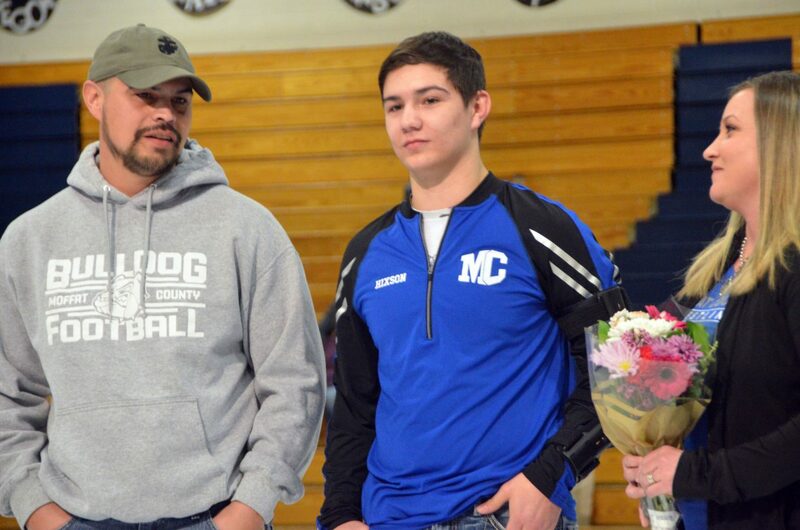 Moffat County High School's Isiaih Herod is joined by his parents as part of Senior Night for MCHS wrestling. 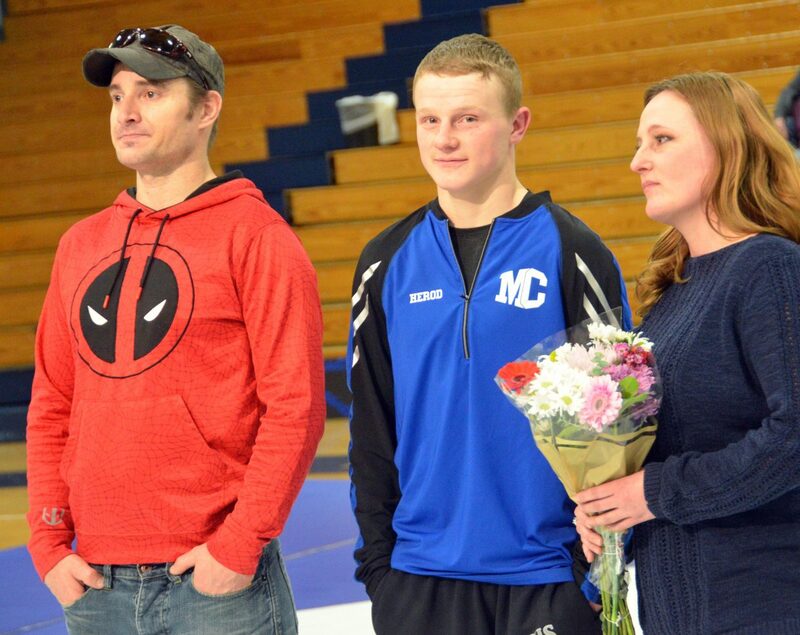 Moffat County High School's Greg Hixson is joined by his parents as part of Senior Night for MCHS wrestling. Moffat County High School's Pepper Rhyne works to keep Palisade's Lodan Head from getting loose Friday night. 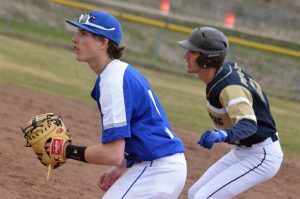 Moffat County High School's Ryan Duzik keeps Palisade's Oscar Juarez motionless Friday night. Moffat County High School's Blake Juergens stays formidable against Palisade's Oscar Juarez Friday night. Moffat County High School's Hunter Fredrickson drives Palisade's Jacob Lee to the mat Friday night. Moffat County High School's Dagan White looks to the ref with a sizable points lead Friday night. Moffat County High School's Anthony Duran makes a move against Palisade opponent Judah Guajardo. Moffat County High School's Colton Jones grapples with Palisade's Raul Inchauregui Friday night. 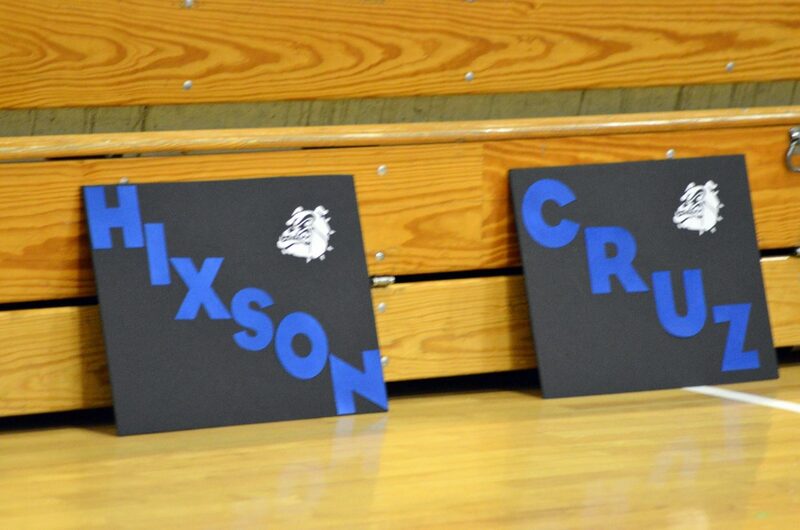 Signs celebrate Moffat County High School wrestlers Friday night. 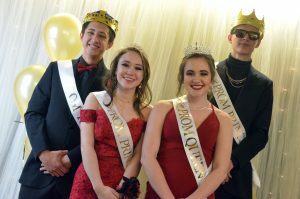 With the scent of a different squad of canines in the Dog House Friday night, Moffat County High School wrestlers were ready to defend their home turf, both for the sake of ongoing glory and to send off their oldest athletes the right way. MCHS finished its final home match of the season with a 31-15 win against the Palisade Bulldogs, an evening which included a Senior Night ceremony for upperclassmen Isiaih Herod and Greg Hixson. The preceding festivities featured Herod and Hixson before the meet with their parents at the center of the mat, introduced by Shane Hadley, who also read off their best memories — both of whom recalled a literal wild goose chase at last year’s state championships — and their post-graduation plans, which is lineman training for Herod and the US Marine Corps for Hixson. The two also served as team captains, joined by Hixson’s cousin, Derek Powers, to meet with Palisade opponents before the event began. 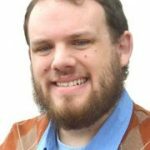 Hixson has been out of action for most of the season after recovering from knee surgery at the onset and later dislocating his elbow in January’s Tournament of Champions to end the year. Though he’s had to observe from the bench in the meantime, it has nonetheless been an enjoyable season. Herod’s final bout in front of a home crowd was an energetic one. 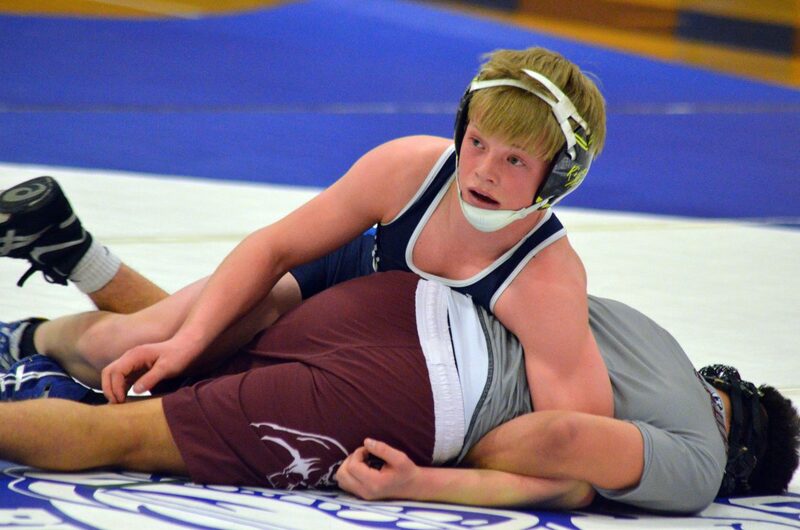 Paired with Cobe Clark in the 132-pound class, he got an early lead of 4-1 before getting the total to 9-2 to close the second period, obtaining a 19-4 technical fall before the final buzzer. Though he wanted the pin, he couldn’t argue with the result. 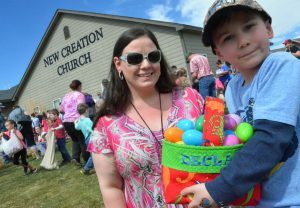 Herod’s victory was one of seven the MoCo crew collected. Forfeits went to Brock Hartung (152) and Daniel Cruz (160) and Palisade’s Ricardo Valenzuela (220) to transition into the real contests, beginning with Moffat’s Hunter Fredrickson and Jacob Lee at 106. 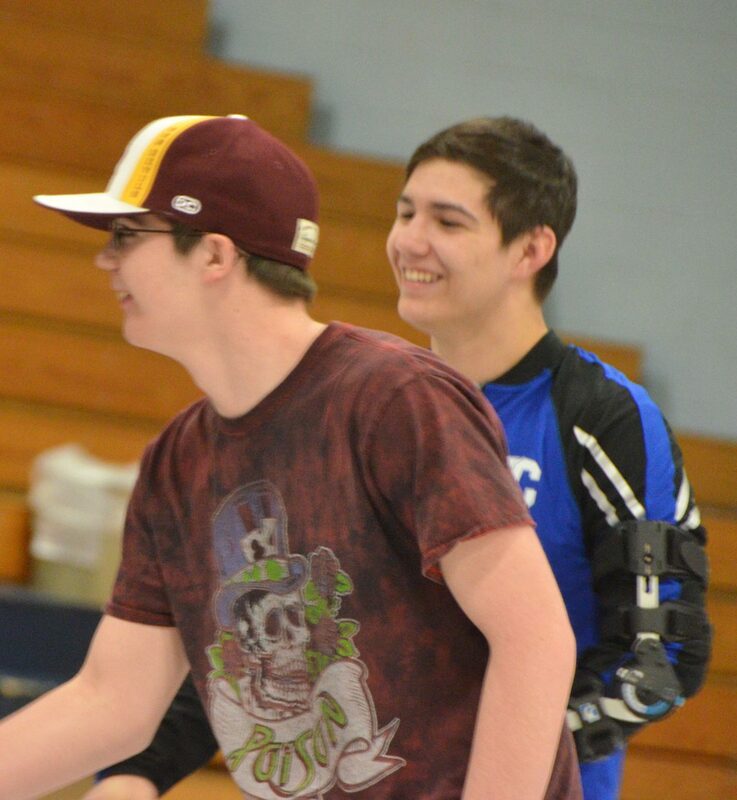 After a 4-0 opening period put him in front, Fredrickson faced resistance in a match that went back and forth, ultimately finishing with the 6-2 win. At 113, Anthony Duran had more trouble against his Palisade foe as Judah Guajardo gained the only varsity pin of the night, getting Duran on his back in 37 seconds. 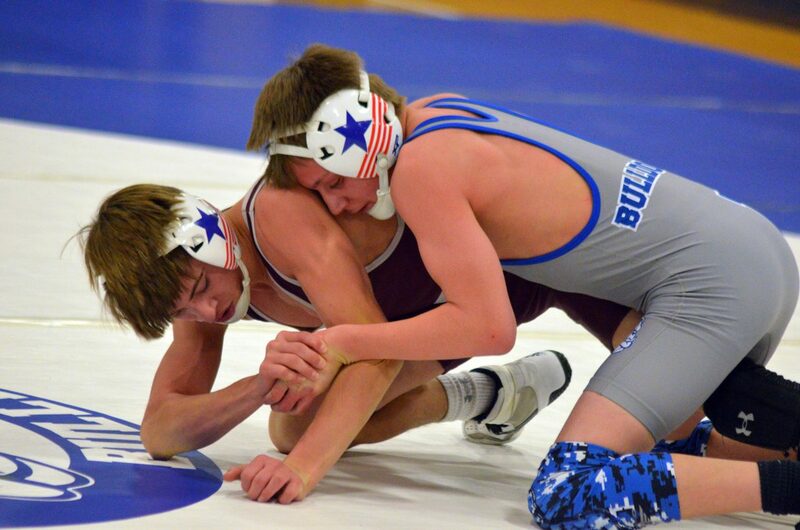 The bout was the second tough go in as many nights for Duran, who also took a defeat to fellow teammate Dylan Zimmerman Thursday in Hayden, an event which MCHS won altogether at 42-16 against the Tigers. 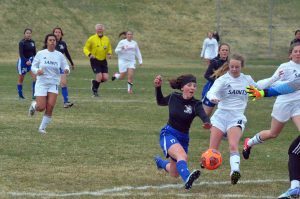 Fans got their money’s worth in Craig, as each of the remaining varsity match-ups went the distance. Dagan White (120) followed Duran with an 8-5 win over Raul Inchauregui, while Ryan Duzik controlled his combat with Oscar Juarez at 126, allowing only one escape in a 9-1 decision. 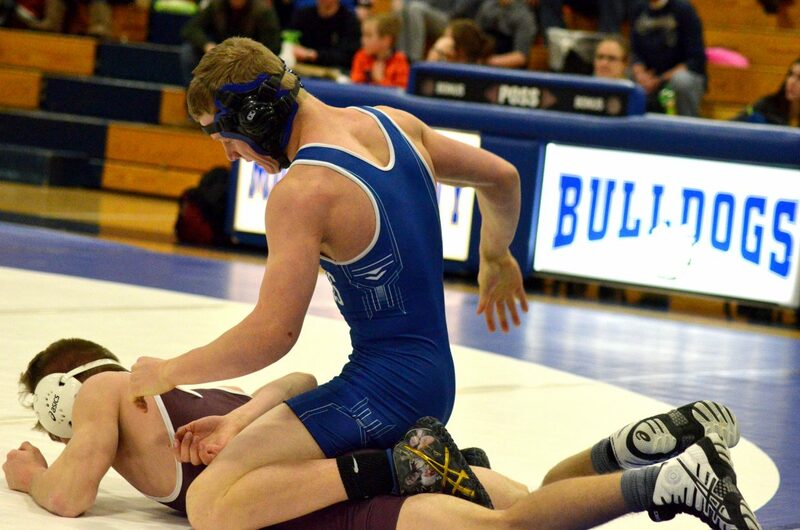 138’s Daniel Caddy likewise dominated against Nathan Bollinger, on the verge of a tech fall at 14-0 to close the second period, ultimately gaining the five team points with a 17-0 finish. 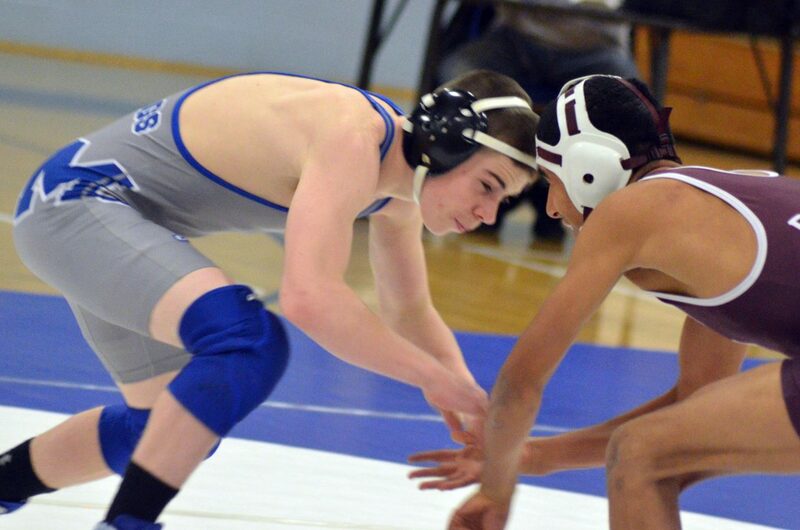 At 145, Pepper Rhyne scrapped with Lodan Head, who gained an early advantage against Rhyne at 4-1 to start. Though he took a 9-3 loss, Rhyne made it a tricky task for his Palisade opponent while he struggled to get many takedowns against Head. 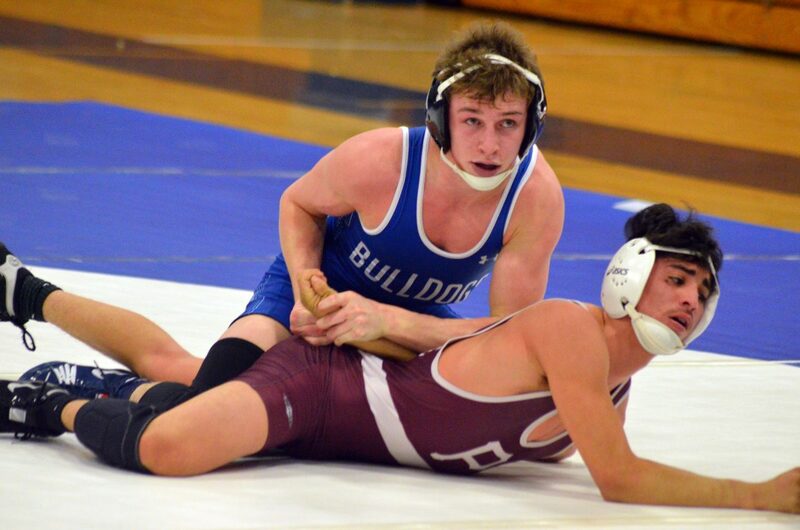 Exhibition matches saw three of the Palisade Dogs back on the mat with Moffat’s JV, and the blue Bulldogs made them regret it. Lee fought hard against Caden Call (106), only for Call to mount a comeback starting in the second period and gaining the 8-6 W in one of the night’s most raucous routs. Colton Jones followed at 120, getting the win by fall over Inchauregui at 39 seconds, while Blake Juergens (126) wrapped up the evening with a 13-7 win over Juarez. The dual was one of longevity, noted MCHS head coach Dusty Vaughn, with wrestlers showing their stamina could make up for some mistakes. 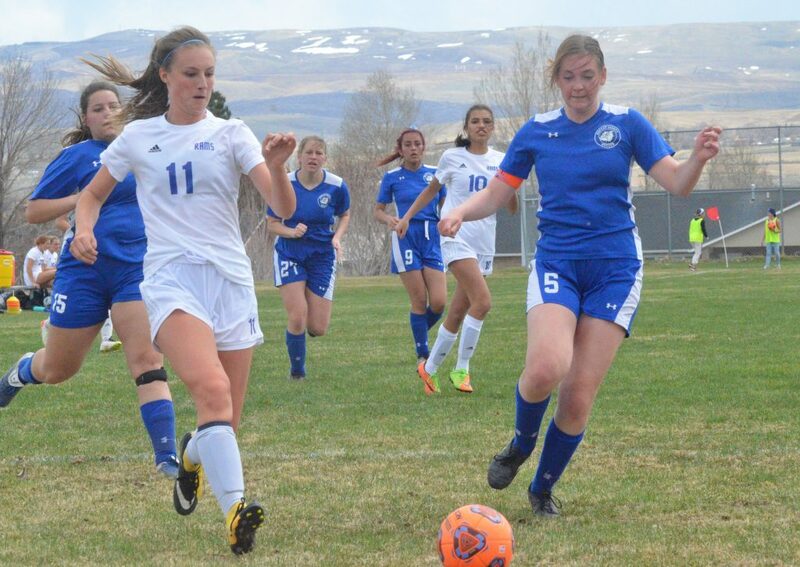 Moffat County next travels to the 3A Region 1 Tournament Feb. 15 and 16 in Montrose. Vaughn said he will be encouraging grapplers to “get blinders on” and focus on the long-term goals.